Mest is a pop punk band from Blue Island, Illinois. - Cousins Matt Lovato and Tony Lovato formed the band together in October of 1995. The band's last guitarist, Jeremiah Rangel, joined the band in 1998. Their previous guitarist was Steve Lovato, Tony Lovato's brother. He left the band due to creative differences. Nick Gigler played drums for Mest from 1997. In 1998, the band self-released Mo' Money, Mo' 40z. Cousins Matt Lovato and Tony Lovato formed the band together in October of 1995. The band's last guitarist, Jeremiah Rangel, joined the band in 1998. Their previous guitarist was Steve Lovato, Tony Lovato's brother. He left the band due to creative differences. Nick Gigler played drums for Mest from 1997. In 1998, the band self-released Mo' Money, Mo' 40z. Their debut album on Maverick Records, Wasting Time, was released in July 2000 and Destination Unknown in 2001. They toured as an opening band for Goldfinger on July 20, 2002 in Las Vegas and then a few months later, released a DVD called The Show Must Go Off! in January 2003. 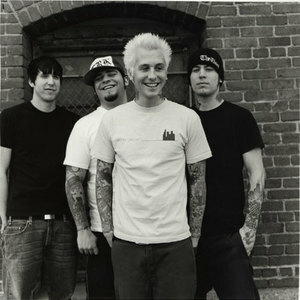 Later, that same year, the band released their self-titled album, which featured the single Jaded (These Years) which featured Benji Madden of Good Charlotte. Some saw Jaded as an attempt to cash-in on Good Charlotte's popularity, because they had been one of the biggest selling bands of 2003. However, Tony Lovato defended this by saying, "The song was going to happen, whether GC had become famous or not." In 2005, a tour with Social Distortion was cut short when drummer Nick Gigler required medical attention. The band's last album, Photographs, was released October 18th, 2005. Two singles released on the internet from the disc, "Take Me Away (Cried Out to Heaven)" and "Kiss Me, Kill Me", which can be found at MySpace, along with the video for the lead single, "Take Me Away (Cried Out to Heaven)". "Kiss Me, Kill Me" is notable for being the only single to be released that featured Rangel as the lead vocalist; something fans on Mest's message board had been demanding for some time. In 2006, the band announced on their MySpace blog: that they had decided to cease performing together. In 2007 Tony Lovato was jailed on suspicion of murder in Los Angeles Sunday after police said he confessed to stabbing his current girlfriend's ex-boyfriend. He was held on $1 million bail after telling police that he was assaulted earlier in the day by Wayne Hughes, 25, in the underground parking lot of an apartment building in the suburb of Studio City. "At some point, Mr. Lovato produced a knife and the victim was stabbed," said Lt. Andrew Neiman of the Los Angeles Police Dept. "He has been booked for criminal homicide." Neiman said police had been called to the apartment the night before, following an altercation between the two, but no arrests were made. Mest's name is derived from a cheep beer known as Milwaukee's Best. Don't let the name decieve you it's a cheep rancid beer but a fine alternative to an Ice House 30 pack.